I am suddenly having problems with the stretch stitch on my sewing machine. I’ve tried fiddling with the tension in both directions, changing the pressure of the presser foot, and using a walking foot but my stitches are still irregular. Can anyone tell me why or suggest anything else I can do? I’ve made three of these pj’s so far and this is the last one. I needed to finish this last set tonight and now I am behind schedule. I would appreciate any suggestions anyone might have. This entry was posted in Beginner, Crafting for others, Gifts, Kwik Sew, Problems, Sewing. Bookmark the permalink. This may not be the answer, but have you tried changing the needle? Lol Faye … that was going to be my suggestion too!! Amazing the difference a new needle can make. If you have already done that then I would suggest setting the bobbin tension back to what’s normal for your machine and then just fiddle with the top tension. It’s rare that the bobbin tension messes up. Have you checked the tension disc with your top thread? Sometimes that can become lose or unstable and then you have no upper tension which will mess with your bottom tension. Which I hope it isn’t because then you will have to say goodbye to your machine while it gets fixed. Good luck!! Oooh. Now why didn’t I think of that? 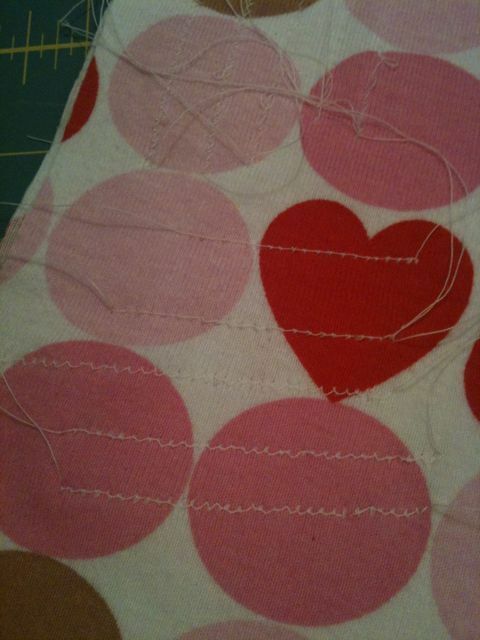 I remembered to change the needles on the serger, but forgot to do that on the sewing machine. DOH!